People often tell Sabahat that she seems so nice and quiet off stage, they never expected her to act like "that" on stage. She is a current member of the indie team Press Play, which she joined in 2010. She has performed with WIT ensemble Season Six, all-women project October Issue, Improv Actually, and WIT Harold teams Spirit Bear, Scorched Earth, and Bloodlust. In addition to studying at Washington Improv Theater, Sabahat has studied at Magnet Theater in NYC. Sabahat has performed improv in festivals across the continent, including in Toronto, Chicago, and New York City. She is a cofounder of District Improv Company, which produces the annual District Improv Festival and cosponsors the monthly Improv Sandbox jam. In her spare time, she enjoys making things she could easily buy and practicing her improv powers on her toddler. Whatever her toddler deigns to slobber over and throw on the ground. Sabahat loves that improv forces people to confront their fears and surprise themselves. 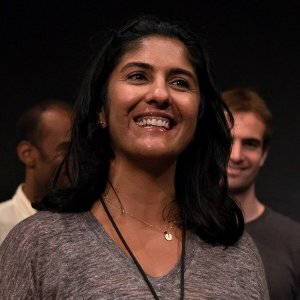 Sabahat loves teaching improv because she loves helping students connect with their creative or wild sides. A lawyer by training, she first started taking improv classes at the suggestion of a college friend, and never, ever thought she would perform on stage or that it would become her passion. She loves to say the more you don’t want to do it, the more you should do it! You may just surprise yourself. She is a current member of the indie team Press Play. She has performed with WIT ensemble Season Six, all-women project October Issue, Improv Actually, and WIT Harold teams Spirit Bear, Scorched Earth, and Bloodlust.